Eastcote is served by one station on the Metropolitan and Piccadilly lines of the London Underground and by three local Transport for London bus routes (which also connect to further stations on the Central and Metropolitan lines). Underground timings below are correct as of 8th October 2018 with the introduction of the autumn leaf fall timetable on the Piccadilly line; this operates until 20th December and there are minor changes to timings of trains on both lines throughout this period. 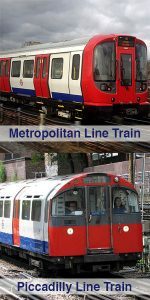 The Metropolitan line service runs daily between Uxbridge and Baker Street/Aldgate via Rayners Lane, Harrow-on-the-Hill, Wembley Park, Finchley Road, Baker Street and Kings Cross St. Pancras. Trains run approximately every 5 to 10 minutes during Monday to Friday peak hours and every 7 to 8 minutes at most other times. In the morning peak, seven trains run non-stop between Harrow-on-the-Hill and Finchley Road; these depart at 0625, 0656, 0725, 0759, 0833, 0905 and 0938. There is also one train in the early evening at 1809. At all other times trains call at all stations. On Mondays to Saturdays trains run from 0522 until 0046 and on Sundays from 0647 until 0025. The last train to leave Baker Street for Uxbridge on Mondays to Saturdays (but see below) is at 0043 and on Sundays at 0020. Engineering work between Baker Street and Finchley Road means that, until the end of 2018, the line closes earlier on Monday to Wednesday evenings between Wembley Park and Aldgate. The last through train to Baker Street on these days departs Eastcote at 2138; thereafter, it is necessary to change trains at Wembley Park onto the Jubilee line to reach central London. From Baker Street, the last through train to Uxbridge departs at 2240; thereafter, the Jubilee line offers onward connections at Wembley Park. The last connection to Uxbridge departs Baker Street at 0040 on these days. The Piccadilly line service runs daily between Uxbridge and central London via Rayners Lane, Acton Town, Hammersmith, Earls Court and South Kensington. Trains run approximately every 5 to 10 minutes during Monday to Friday peak hours and every 20 minutes at most other times. During Monday to Friday peak hours, generally one train in three and at other times one train in two starts from Rayners Lane; it may be quicker to take the first Metropolitan line train and change at Rayners Lane for stations beyond there. On Mondays to Saturdays trains run at 0527 then from 0628 (Mondays to Fridays) or 0853 (Saturdays) until 0036; on Sundays they run at 0655 then from 0853 until 0013. The last train from central London with an onward connection towards Uxbridge departs Green Park at 0034 on Mondays to Thursdays, 0035 on Fridays and Saturdays and 2340 on Sundays (changing at Acton Town). Metropolitan and Piccadilly line trains run to Uxbridge from 0549 until 0123 on Mondays to Saturdays and from 0711 until 0047 on Sundays. From Uxbridge back to Eastcote, trains run from 0512 until 0036 on Mondays to Saturdays and from 0636 until 0014 on Sundays. Live departure boards for the Metropolitan and Piccadilly lines can be found here. Tube map can be found here (pdf). Route 282 runs daily between Mount Vernon Hospital and Ealing Hospital via Northwood, Northwood Hills, Eastcote, Eastcote Lane, Northolt, Yeading and Greenford. In Eastcote itself it runs along Joel Street, High Road Eastcote and Field End Road. Buses run about every 13 minutes during the day on Mondays to Saturdays and every 16 minutes at most other times (every 21 minutes early on Saturdays and Sundays). Buses depart Eastcote Station towards Northolt from 0525 until 0015 daily and towards Northwood from 0543 until 0032 (0033 on Sundays). There are additional journeys on schooldays only, one in the morning towards Mount Vernon Hospital and two in the afternoon towards Greenford/Ealing Hospital. The full timetable can be found here (pdf). Route H13 runs daily between St Vincent’s Nursing Home and Ruislip Lido via Northwood Hills, Pinner, Eastcote Village and Ruislip. In Eastcote itself it runs along Bridle Road, Field End Road, High Road Eastcote and Eastcote Road. Buses run about every 20 minutes during the day on Mondays to Saturdays and from late morning to late afternoon on Sundays and every 30 minutes at all other times. One additional journey runs in the afternoon on schooldays only in the Pinner direction. Buses depart Field End Road/High Road towards Ruislip from 0615 on Mondays to Fridays, 0614 on Saturdays and 0714 on Sundays until 0013 daily and towards Pinner from 0610 on Mondays to Fridays, 0609 on Saturdays and 0709 on Sundays until 0009 daily. Route 398 runs daily between Ruislip Station and Wood End via Ruislip Manor, Eastcote, Rayners Lane, South Harrow and Northolt Park. In Eastcote itself it runs along Southbourne Gardens, Field End Road and North View. Buses run about every 30 minutes throughout the day. Buses depart Eastcote Station towards Rayners Lane from 0636 on Mondays to Fridays (0635 on Saturdays and Sundays) until 0005 daily and towards Ruislip from 0712 until 0043 daily.